Poke (pronounced poke-ay, not poke-ee) is a raw fish salad originating from the shores of Hawaii, traditionally starring cuts of tuna marinated in soy and sesame. And, since hitting our shores, Auckland has seized the trend and taking it to a whole new level. Served with the likes of pickled ginger, smoked tomato and wasabi mayo, here’s where to get poke in Auckland. It seems very fitting to overlook the ocean as you dig into a fresh poke salad. You can do exactly that at Princes Wharf’s The Culpeper. The raw salad here stars generously-sized chunks of tuna paired with cucumber, avocado and red onion. It’s garnished with sesame, spring onion and crispy seaweed. Pair your Poke with a ice cold bevvvy and you've got the perfect inner-city escape. What plane ticket? Sweet in the morning, savoury in the afternoon and frickin’ delicious all round, Ha! Poke knows how to bowl. The morning menu boasts granola bowls, berry bowls and our personal fave tropical bowl—banana, pineapple, coconut chips, mango purée, corn flakes and mint leaves. While the afternoon sees kimchi bowls, spicy bowls and aloha bowls boasting all the savoury poke essentials—spicy salmon ad fried garlic anyone? Located in Auckland University, if you’re around town and hungry you now know where you belong. Rather suiting, them Shore people seem to l-o-v-e a good poke bowl. Yeah Bowl is taking the world by storm with their vibrant bowls of fresh errything. Making this grab-it-and-go meal even more convenient, you can order a house favourite bowl from the menu—AKA a saviour for you indecisive humans. Or if you’re more a DIY kind of person, throw your own creation together and perfect the flavour combos. 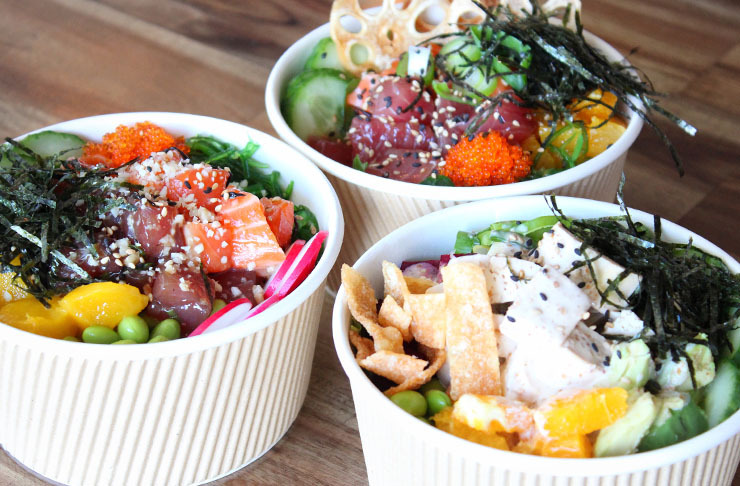 Serving poke, poke and even more poke is Shaka Bowl. Choose the star of your bowl—marinated salmon, tuna or tofu—and then layer it up with veg (or fruit). Think edamame, spring onion, cucumber, pomegranate or mango. Your masterpiece of salad is then drizzled with your choice of sauce (our go-to is the wasabi mayo). Check out our verdict here. 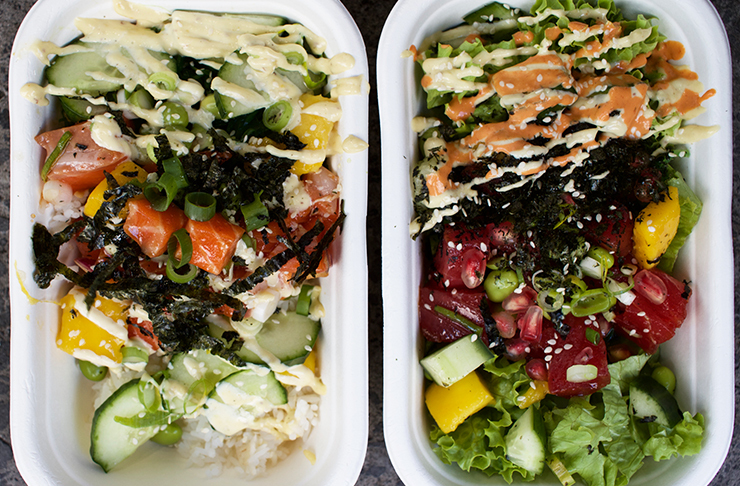 Located in the heart of Auckland City is the aptly named Poke Time. Things are easy as one, two, three, four here! Choose your rice, protein (sashimi, prawn, crab, tofu or teriyaki chicken), toppings, sauces…and voilà—you’ve got one delish poke! Wash it down with coconut water and you’ve got a nutritious (and delicious!) meal. Not only do Dear Jervois rock at oh-so Instagrammable waffles, they also do a wicked poke bowl. The salad stars a bed of quinoa rice topped with fresh salmon, avo, seaweed and pickled ginger. Known for their pretty dishes, the café adorns the dish with black and white sesame seeds and spring onion. And yes, it’s as Insta-worthy as the waffles. Takapuna’s now infamous Poke Poke takes a modern twist on the Hawaiian classic with offerings such as chicken, prawn and tofu. Don’t fret though, for seafood lovers Poke Poke offers the highest sashimi-grade king salmon and tuna—that’s how we roll kids. With options of white rice, purple rice or salad, you then simply choose your protein and then go to town with the delicious extras. Edamame, cucumber, pickled ginger, fruit salad—take your pick. 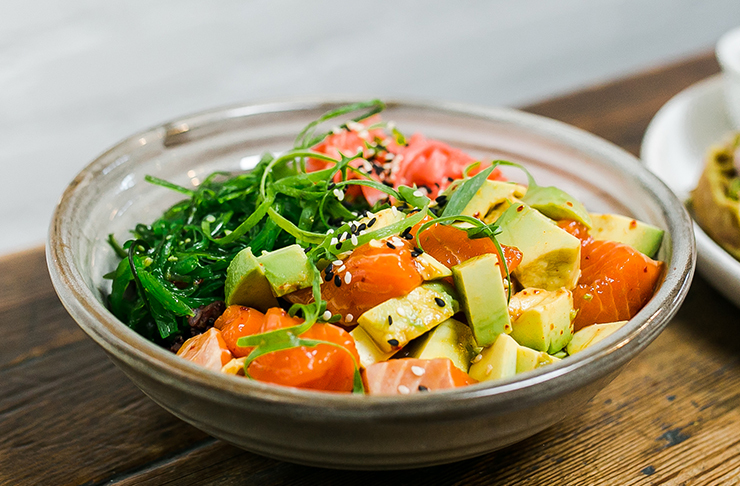 Potentially the most grammable Poke location of the lot, Blue Poké Shed’s interior sees beach-inspired paintings, rustic wooden tables and damn divine looking bowls. Located in Albany, the team have taken this Hawaiian cuisine up a notch with toppings such as reckon chips and wonton crisps. Pro tip: grab your poke to go and enjoy it at a near by beach—surrrrfer style. St Heliers' Porch Bar & Eatery is a top contender for the prettiest poke in town. Their lovingly crafted dish features fresh salmon served with edamame, quinoa, pickled daikon and avocado. It’s decorated with radish, grated carrot and microgreens. The dish is almost too pretty too eat…almost! Oh, and while we’re at it, their fresh fish sliders are equally divine!